My kids surprised me with this fall arrangement, assembled by my daughter Rachel, and it is making a gray day very cheery! 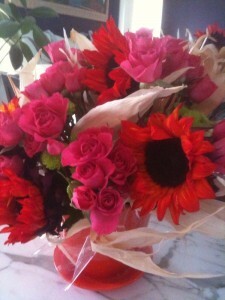 The orange sunflowers, green pom poms, and pink roses are just amazing. And if you are wondering what the filler is….Rachel used little mini Indian corn stalks! Please feel bad, but don’t feel badly. Those are beautiful. I love orange sunflowers and I love overcast cloudy days. I yearn for them, but then again I rarely get them down here in Arizona. I like the look of those sunflowers with the pink roses. Lovely! Your server is under attack again. 🙁 My Norton squashed it, but it looks like someone needs to clean up the site again. I’ve been reading along with Becky Piliego on The Fruit Of Her Hands. Thank you again for sticking your neck out and writing against the grain of what is popular. I wish I could give you some flowers too! 🙂 I am struck anew by how much your teachings helped me hold onto my priorities as wife and mother through difficult circumstances. Thank you!